Late night funnyman Jimmy Kimmel got choked up Tuesday night as he summed up all the things wrong with Cecil the lion's murder in Zimbabwe earlier this month. Kimmel recounts the disgusting story: How two guides tied a dead animal to the back of their vehicle to lure the lion out of a protected park and shined a spotlight on the poor animal while a dentist from Minnesota, who paid over $55,000 for the trip, shot Cecil with a bow and arrow; how this did not kill him; and how Cecil fought for his life for 40 hours while the crew followed him, determined to kill him and take his head for a trophy. Researchers from Wildlife Conservation Research Unit at Oxford University, who had put a tracking collar on Cecil, discovered that the men tried to destroy the tracking device so no one would know they'd killed one of the world's most beloved lions. After the public learned that Cecil had been killed and discovered that the dentist, Walter Palmer, was to blame, Palmer released a statement saying he had no idea the animal he "took" was a local favorite. 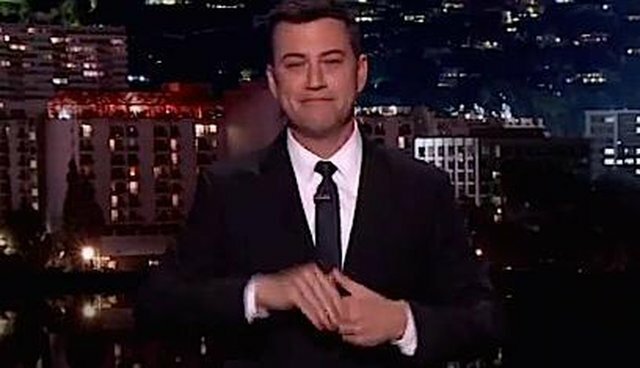 "First of all," Kimmel points out, "stop saying you 'took' the animal. You take Aspirin; you killed the lion." He goes on to condemn the brutal practice of trophy hunting. "Why are you shooting a lion in the first place? I'm honestly curious to know why a human being would feel compelled to do this - how is that fun? Is it that difficult for you to get an erection that you have to kill things?" Not categorically against hunting to eat or keep animal populations healthy, Kimmel points out that it's totally unnecessary to go trophy hunting. "If you're some A-hole dentist who just wants a lion's head over the fireplace in his man cave so his douchebag buddies can gather around and drink scotch and tell him how awesome he is, that's just vomitous." And it wasn't the first time, Kimmel points out, showing photos of Palmer with his previous trophies. Kimmel gets choked up as he appeals to his audience to help "have some good come out of this tragedy." As he asks that the public to help the Wildlife Conservation Research Unit at Oxford, who had been researching this beautiful animal, he has to pause and take a deep breath before continuing with the end of his segment. Everyone is heartbroken by the loss of Cecil. Rest in peace.